I was looking for a good way to add a LED night light for our trailer for the kids. I know that some bigger rigs have runner lights that would act as a night light. But our rig is a 21′ Hybrid, really one room with 2 beds on either end plus a bathroom. 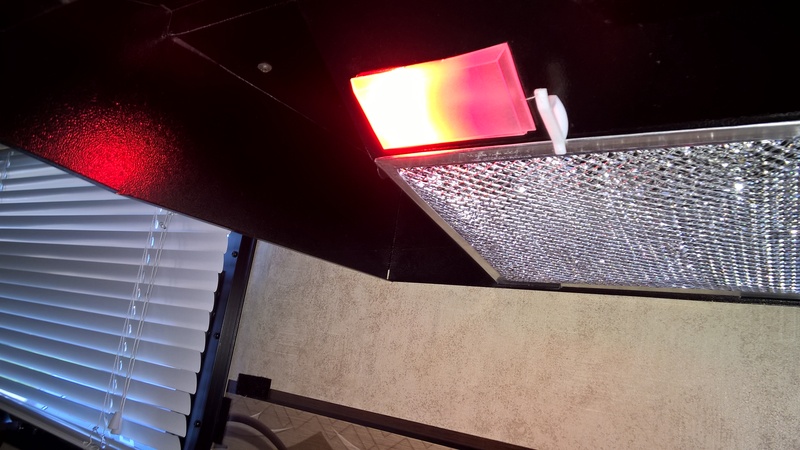 This was a simple idea that I came across in an RV forum and I knew as soon as I saw it that it would work. The forum post suggested using a Red light. From what I understood about Photography, and the Army and Navy using red lights when operating at night, I figured there was some science behind the idea. So the first thing I considered what where to put it and the second was how bright. For location I decided on the light in the stove fume hood. Since we really did not use this light, I figured I could sacrifice it for the cause. Any other light fixture would mean less usable light. This turned out to be the perfect location as the stove is fairly central in the trailer. The next issue was brightness. First I knew that a red bulb would not produce as many Lumens as a same wattage clear bulb so I knew I needed to be a little brighter than the lowest wattage bulb I could find. I decided on a 24 SMD LED bulb, a moderately bright LED. I ended up getting 2 on eBay for about $5. It worked out perfect.